According to the National Survey of Children’s Health, nearly 35 million children in the United States are living with emotional and psychological trauma. For these children, the effects of abuse, neglect, poverty, violence, imprisonment, homelessness, and loss come at a serious cost to their health and educational attainment. Their traumatic experiences impair their ability to learn, alter their brain chemistry and development, prompt feelings of isolation and helplessness, and may even catalyze the onset of a mental health disorder. While 35 million children are dealing with trauma of some kind, only a fraction of these students—approximately 8 million of them—have access to a school psychologist. Even fewer students have access to a social worker. Across the nation, only 63 percent of public schools even offer all students a counselor. As the Center for American Progress has found in a first-of-its-kind analysis, America’s most vulnerable youth must contend with an alarming inadequacy of mental health and counseling services in their schools. Our findings reveal low levels of student access to full-time counselors, psychologists, and social workers in nearly every state across the country, but with significant regional variation. In addition, the few mental health providers who are available in public schools tend to be overworked and undersupported. The lack of adequate school-based services for children dealing with trauma is a particular hardship for students of color. Not only are children of color most likely to experience multiple traumatic events, but 38 percent of African American children, 32 percent of Hispanic children, and 35 percent of Native American children live in poverty—a major risk factor for psychological distress. Making matters worse, instead of receiving positive supports or guidance in school, these students frequently face suspension, expulsion, and even contact with law enforcement. In the 2013-14 school year alone, nearly 3 million students were suspended out of school. Research shows that these harsh disciplinary measures excessively target students of color for only minor infractions—such as gum chewing, cell phone use, and inappropriate dress—and are often a result of racial bias. However, little attention has been paid to the fact that trauma is a contributing factor of classroom disruptions, outbursts, and truancy, and long-term exposure to violence causes severe emotional and behavioral difficulties. In fact, the students who are most likely to be penalized by zero-tolerance discipline policies, most likely to drop out of school, and most likely to enter the criminal justice system—a process otherwise known as the school-to-prison pipeline—are traumatized children. A staggering majority of youth in juvenile detention facilities—over 90 percent—exhibit symptoms of either post-traumatic stress disorder or another mental health condition. Yet, national conversations on the school-to-prison pipeline have paid scant attention to this issue. Many students who are forced out of school carry unaddressed mental health needs, with few resources available to support them. Students who are disproportionately subject to suspensions are students dealing with the most complex forms of untreated trauma. Because these children display behaviors that are too swiftly perceived as disruptive, they are punished through harsh disciplinary action. Moreover, an excessive number of these children are of color. Black children, for instance, are nearly three times as likely as white children to be victims of child abuse or neglect but are nearly three times less likely to receive mental health care when in need and nearly four times as likely to be suspended for minor classroom misconduct. These statistics indicate that the administration of school discipline is more than an issue of behavior or a product of implicit bias. Oftentimes, it is the signal of an unmet need. Although most schools do not offer on-site mental health services, they usually provide referrals to external, community-based organizations. This approach, however, has not effectively increased access to mental health care. In fact, only 16 percent of children who need mental health services receive them, and roughly 80 percent of the children who do gain access receive them in school settings. However, shrinking state and local budgets and misplaced priorities have led to a scarcity of school-based mental health providers. Across the nation, only 63 percent of public schools offer a full-time counselor; 22 percent have a full-time psychologist; and 18 percent have an in-house social worker. CAP has collected state-by-state data on student access to licensed mental health professionals using data provided by the National Center for Education Statistics. For a full detailed table, see Table 1 in the Appendix. Our findings reveal a lack of licensed mental health and social services for students nationwide, although there is a notable degree of regional variation. For instance, some states in the South—such as Alabama, Mississippi, and Texas—have the lowest availability of psychologists and social workers. Take Alabama, for instance, where the percentage of public schools with full-time, in-school psychologists is close to zero percent. While these states boast a greater availability of counselors—due to the number of state laws in this region mandating school counseling—the average number of students per counselor in these states is alarmingly high, well above the national average. The American Counseling Association recommends a school-to-counselor ratio of 250-to-1, but certain Southern states have ratios nearly double that figure. For instance, the average student-to-counselor ratio in Mississippi during the 2011-12 school year was 436-to-1, and just 3 percent of the state’s public schools employed a full-time psychologist. As a result, Mississippi schools are grossly understaffed, and the counselors who are available are considerably overworked. The presence of a school counselor should not negate the need for school psychologists and social workers. These professionals perform discrete roles as support staff and hold different credentials, licenses, and training in mental health and social services. When less than 20 percent of American children who need such supports actually receive them, one counselor for over 400 students is simply not enough. CAP also found that states in the South had some of the greatest racial disparities in the use of exclusionary discipline. In other words, not only do students of color have low levels of mental and social service supports in the South, in this region, they are also disproportionately suspended, expelled, and subjected to corporal punishment. For instance, among the 57,000 reported incidents of corporal punishment applied to black students in the 2011-12 school year, just seven states—Mississippi, Alabama, Georgia, Arkansas, Texas, Louisiana, and Tennessee—accounted for 90 percent of the incidents. Yet, these seven states only have psychologists in 10 percent of their schools. These egregious disparities in suspension and expulsion rates are not relegated only to the South; they are evident in other states with low numbers of school counselors, psychologists, and social workers. For instance, only 59 percent of Wisconsin’s public schools employed a full-time counselor in the 2011-12 school year, yet more than one-quarter of the state’s black students received an out-of-school suspension. The relationship between the low level of support services and the high use of exclusionary discipline is deeply troubling. Most students who have experienced trauma have not received professional attention or care, yet they are more prone to being harshly disciplined for behaviors that may arise as an outward response to toxic stress. In extreme cases, these disciplinary incidents themselves are yet another traumatic event. An incident that went viral last year brought national attention to this issue. On October 26, 2015, a school police officer in South Carolina assaulted a black female student seated at her classroom desk. A few months prior to the incident, the girl’s mother, who was her only custodial parent, died. The girl, who had just entered the foster care system, was also adjusting to an unfamiliar schooling environment. In one of her classes she supposedly displayed defiance by not putting away her cell phone “fast enough,” and an officer was called in to address the alleged misconduct. But in a shocking and completely unprofessional attempt to force compliance, the officer slammed the young lady to the ground and dragged her across the classroom floor, eventually placing her under arrest. Given the young lady’s life circumstances, it would have been much more appropriate for a counselor, social worker, or psychologist to have intervened. The girl had recently lost her mother and was in greater need of counseling and therapy than the punishment that instead transpired. But, perversely, troubled youth such as this student are being told that their emotional and psychological needs are a punishable offense. CAP’s findings bring into question how public schools—particularly in high-poverty and/or urban communities—consider the issue of student wellness. When children live in resource-deprived neighborhoods; witness community violence; experience family dysfunction; lose a parent to death or incarceration; are exposed to mental illness; and/or lack basic amenities for survival such as safe and clean drinking water, suffering becomes normal. Toxic conditions leave these children in an emotional, mental, and physiological state of fear, causing them to act out or shut down in classrooms when they are triggered. Accordingly, it is perplexing to observe that Alabama suspended almost 20 percent of its black students in the 2011-12 school year, yet less than 1 percent of the state’s schools reported employing a full-time psychologist. Equally troubling is the fact that in the 2011-12 school year, only 47 percent of Rhode Island’s schools employed a full-time counselor, yet 13 percent of the state’s Hispanic students received an out-of-school suspension. Unpacking the full social, political, and economic forces behind these disturbing numbers is beyond the scope of this issue brief. Nonetheless, the unfair and unequal access to school-based psychological and social support services—an inequity that tracks racial lines—requires serious attention. How serious is the issue of trauma? School districts tend to prioritize placing counselors in high schools rather than in elementary and middle schools because of their role in providing college and career guidance. While this may be a well-intentioned approach, it is shortsighted. Most traumatic childhood experiences occur well before the age of 13, and early intervention is key to preventing learning and behavioral problems during adolescence and adulthood. The effects of childhood trauma do not magically disappear at the front steps of a school building. Without early intervention, trauma drives down academic performance and increases the likelihood of grade retention. In fact, one study found that children with four or more adverse childhood experiences were 32 times more likely to have a learning or behavior problem in school compared to children who have not had any traumatic experience. A history of multiple traumatic events is very common among poor children of color. Poor and black youth, for instance, are most likely to be self-managing three or more adverse childhood experiences, which puts them at the highest risk for mental illness. These children also tend to have an emotional or behavioral disability; identify as lesbian, gay, bisexual, transgender, or queer, or LGBTQ; or be non-English native speakers. These children often must wrestle with multiple forms and incidences of trauma simultaneously. Yet, these children and children of color rarely receive adequate care. Native American youth, in fact, suffer the greatest barriers to mental health care among all children of color. They are also twice as likely to commit suicide as other racial groups, with 22 percent of Native females and 12 percent of Native males reporting at least one suicide attempt. With few resources available to support them in their communities, children of color are entering classrooms carrying unaddressed emotional needs—needs that continue to go unmet in schools. While school safety and discipline are legitimate concerns, students need and deserve thoughtful policies that recognize not only their lived realities but also their humanity. Districts can look to the success of El Dorado Elementary School in San Francisco, California, as a promising example of trauma-sensitive education. Students at El Dorado are predominantly African American and Latino, and they live in the poorest neighborhoods in San Francisco. In 2010, the school partnered with the University of California, San Francisco to establish a trauma-informed intervention program. Students now have access to an on-site facility called the Wellness Center that is fully equipped with a school social worker, family therapist, and behavior coach. Whenever a student misbehaves in class, rather than receive an out-of-school or in-school suspension, the student receives a pass to the Wellness Center, a safe space for them to recover emotionally and receive services from the mental health support team. Students also engage in restorative practices at the Wellness Center, where they speak with the peer that they had a conflict with and discuss ways of repairing harm. Since implementation, the number of disciplinary referrals for misbehaviors—such as yelling or fighting—has dropped from 674 incidents in the 2008-09 school year to 50 incidents in the 2014-15 school year. Suspension rates have also plummeted by 76 percent over the same time frame. Clearly, there are benefits to school-based support services for vulnerable children. However, culturally competent care remains especially essential for racial and ethnic minority populations, who face significant structural, cultural, and linguistic barriers to treatment. Students also may not be willing to confide in their counselors if they distrust the school or believe that they will receive discriminatory treatment. Prioritize funding for school-based counseling and mental health programs. Federal, state, and local policymakers should strengthen the availability and quality of school-based mental health programs and prioritize the placement of licensed mental health professionals in underserved communities of color. State laws should also mandate counseling at the elementary and secondary grade level and require lower student-to-counselor ratios. Public policymakers should also increase funding sources for reform models that establish school-based mental health centers, such as full-service community schools. Develop culturally responsive policies for emotional and behavioral supports. Districts should promote student wellness through strategies that are responsive to a community’s diverse racial, ethnic, cultural, and linguistic backgrounds. Culturally appropriate strategies include cultural competency training for school staff, as well as bilingual translation services. Districts should also explore ways to reduce the stigma often associated with mental health conditions in communities of color. For instance, school leaders can consult parent advocacy groups and community-based organizations during the planning stage of a trauma-informed program. They can also survey students in a comprehensive needs assessment, asking them to identify the specific supports they’d like to see implemented at their school. Implement a restorative—not punitive—approach to school discipline. Schools should establish crisis intervention teams made up of mental health providers, educators, administrators, parents, and community members to lead positive, restorative interventions for disciplinary incidents, similar to the programs at El Dorado Elementary School. It is important to note that breaking the cycle of trauma will require a collaborative effort among leaders in the education, health, social services, child welfare, criminal justice, and community development sectors. Nonetheless, these policy recommendations focus primarily on the school’s role in meeting the needs of the whole child. For many children, school is a second home—a new opportunity to form healthy relationships with their peers and adults. The public schooling system has not meaningfully invested in the resources that provide our nation’s most vulnerable youth a full and fair opportunity to succeed. 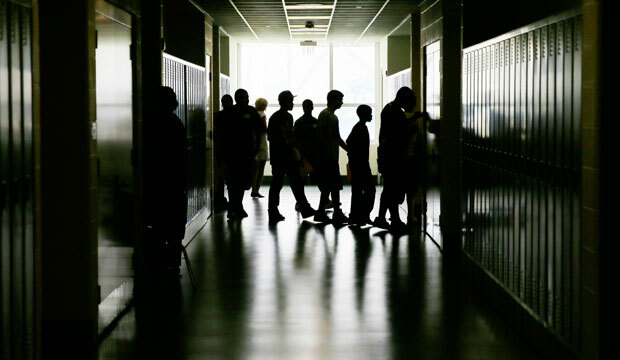 To hold traumatized students to a strict discipline code—and thus remain apathetic regarding the mental health disparities stratified by race and social status—is at best reckless negligence. Suspensions and expulsions will only exacerbate feelings of depression, disengagement, and disillusionment. Physical restraints, beatings, and arrests will only further harm children trying to cope with trauma. If it is true that all children deserve fair and equal treatment irrespective of their race, class, and background, then their experiences of pain and suffering should be equally recognized as such, and disciplinary practices should rely on the value of compassion rather than criminalization. School leaders must reconsider their priorities and their responsibilities when it comes to vulnerable children of color, and they must make every effort to meet the needs of this often-neglected student population. Perpetual Baffour is a Research Assistant for the K-12 Education Policy team at the Center for American Progress.